Shackleton’s every move is watched very carefully, like Warren Buffett’s in the world of finance, and this record has not remained unnoticed by punters and clubbers. 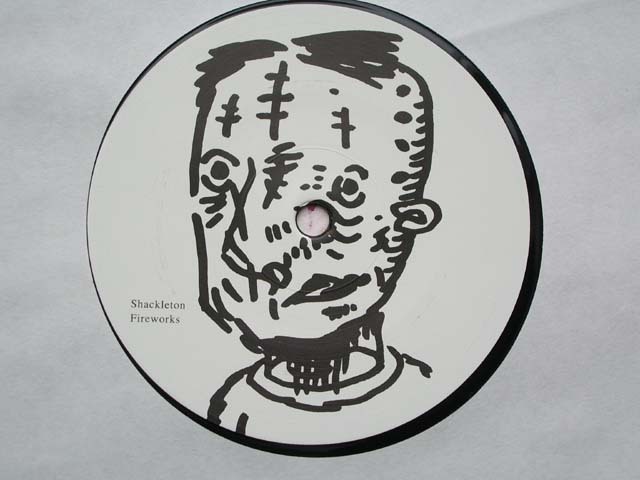 Shack’ offers two tracks, “Fireworks” and “Undeadman”, that swim in the sea of deep bass and hollow clonks, surrounded by so-beloved congas, and still maintain delicate touch. “Undeadman” might be close to the heart of zombies, if they have one. One remix is by T++, keeping the floating and complex atmosphere of “Fireworks” and sounding like stripped-down The Orb. Torsten Pröfrock does his job like in the days of DIN, however would have expected him sticking to the equatorial breakbeats of “Wireless”, published last year on Honest Jon’s too. Then the change happens on the D-side, where ReMMix by Mordant Music shows the irrational side of the electronics. Imprisoned by stealth dub and chaotic noise samples, it is my favorite here. Mordant is not beautiful, but it is not a Miss World contest either.